Hear from other owners & operators about their experiences as independent Pepperidge Farm distributors. Owning a Pepperidge Farm Distributorship can be a personal and financially rewarding experience. Like Pepperidge Farm’s founder, Margaret Rudkin, who captured and thrived on an entrepreneurial spirit, we invite you to explore the avenues for success that may be available to you as a Pepperidge Farm independent distributor. 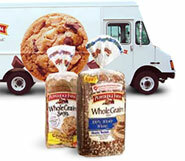 Pepperidge Farm® is one of the most respected brands in the food industry. The secret to Pepperidge Farm’s success is our independent distributors. As an independent distributor, you benefit from the backing and outstanding reputation of the Pepperidge Farm organization. You also enjoy the independence and satisfaction that only comes from being a self-employed entrepreneur. You have a defined geographic distribution territory in which to sell and deliver either Pepperidge Farm® branded Bakery or Snacks products to retail stores. You have an obligation to realize the full sales potential of such products within the territory, which is yours to develop as an independent business. Every independent distributor (known as a sales development associate, or SDA) brings their own experiences, talents, creativity and drive to their business. That’s what makes owning your own Pepperidge Farm distributorship a dynamic and rewarding business experience.